Quick assists provide fast access to code refactoring operations. To see the list of available Quick Assist Proposals simply press Ctrl+1. Use the Up and Down arrows to select a proposal, then press Enter to apply it. The proposals depend on the editing context. For example, to split a function into 'extern' prototype and implementation, place the editor cursor on the function declaration and press Ctrl+1. To extract a block of actions to a new method, select the block and press Ctrl+1. 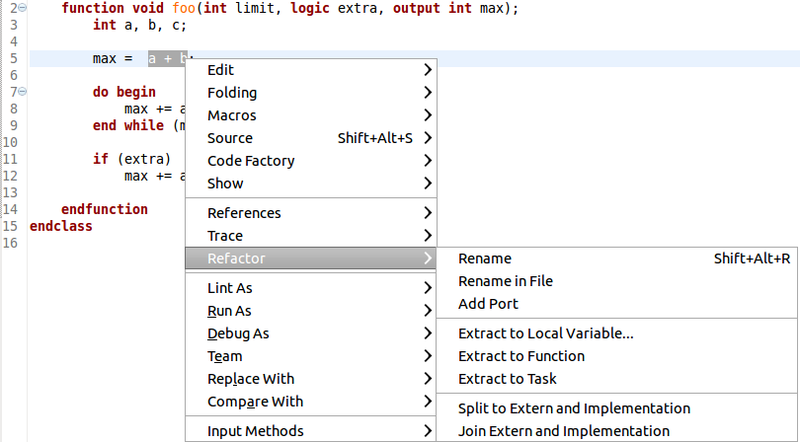 Tip: Right-click in the editor and go to the Refactor submenu to see all refactoring operations.